Evinrude has announced a new outboard engine line called the G2. These V-6 engines are 200 - 300 Horsepower with 210 cubic inch displacement. The motors are reported to have a 20% more torque and improved fuel economy (15%) along with built in hydraulic steering and in many cases power hydraulic steering. The G2 also has a new trim system, digital integration with gauges, a sleek SLX gear case. This means the G2 motors will all be controlled and monitored with electronics so no more mechanical controls and cables. Different colored side panels can be ordered for the motors. There is no scheduled maintenance for 5-years or 500 hours. I am told that Teleflex/SeaStar Hydraulic helms and hoses work with the Evinrude G2 engines. The new G2 motors cost more money. As an example the Manufacturers Suggested Retail Price (MSRP) of a 20" shaft length 200 HO is $2,311.00 more for the new G2 motor with "Integrated Hydraulic" steering than a mechanical controlled 200 HO. The G2 has 10 more cubic inches of displacement. If you want what they call "Integrated Power Steering" add $650 MSRP on to the G2's MSRP on the 200 HO model. I don't have a cost on the parts and pieces needed for rigging the new G2 engines. The older style mechanical and ICON controls are not compatible. The new G2 motors are slightly heavier and longer so the center of gravity is going to be further back and higher which will translate into the bow of your boat coming up more. The motors weigh around 30 lbs more plus the oil tank is now built in to them so the weight of the oil will also add to the total weight on the transom. How much the center of gravity changes is yet to be determined. 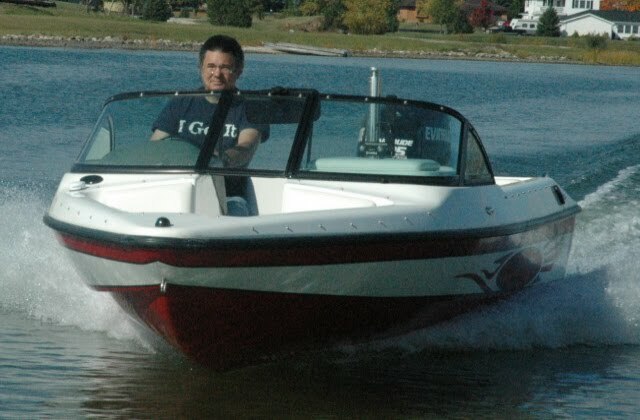 For twin and triple motored installations the motor spacing will need to be wider according to my inside sources at Evinrude and my "in the loop" ski team contacts. It looks like it will need to be about 1.5" wider. The built in hydraulic steering system should make it easier to space the motors further apart. With twins and triples on our 20' Closed Bow Models a different rope guard will be needed for the new engines. I am still trying to find out exactly how the steering will have to be physically connected for triple installations. If you do a online search there are interesting articles and I expect more every day. Here are a couple links you may be interested in checking out. I am anxious to try some of the G2 motors, I think!